Did you know that Asian Americans and Pacific Islanders are the fastest-growing racial group in the country? AAPIs are expected to more than double to over 47 million by 2060. With such dramatic growth comes the critical need for federal agencies and policymakers to better understand the needs and challenges facing our community, from health care to language access. A lot of it comes down to data. 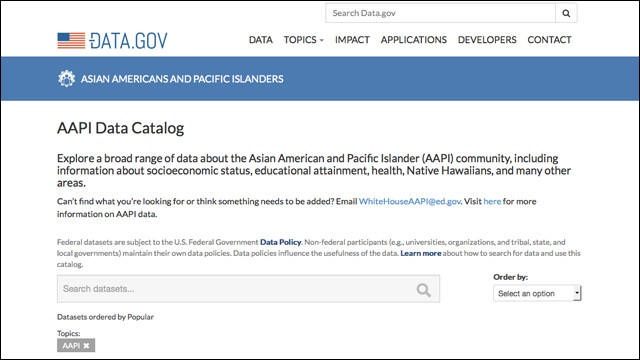 So... this week, the White House Initiative on Asian Americans and Pacific Islanders, in partnership with Data.gov, launched Data.gov/AAPI, the most comprehensive hub of government data on AAPIs. With approximately 2,000 datasets and reports from nearly 50 federal, state, county and city sources pertaining to Asian Americans, Native Hawaiians and Pacific Islanders, these data can help federal agencies, policymakers and the public understand and address disparities in socioeconomic status, educational attainment, health and other areas of importance to our community. - Asian American veterans are among the oldest in age. Explore the data. - In the first year of college, Asian American and black students have the highest enrollment rates in remedial education courses. Explore the data. - Of the immigrant orphans adopted by United States citizens, nearly half are of Asian descent. Explore the data. - Pacific Islanders have among the highest unemployment rates of all racial and ethnic groups. Explore the data. - The AAPI community is expected to more than double to over 47 million by 2060. Explore the data. For more information, start poking around on Data.gov/AAPI.